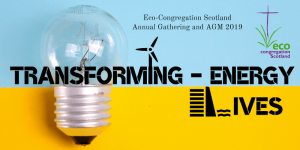 The 2019 annual gathering will explore how the people of Scotland needs to majorly transform our way of life, changing how we interact with and use energy. The event will see speakers who are leading the changes and congregations who are responding to this challenge: transforming energy; transforming lives. Neil Kermode is one of the keynote speakers at this event, speaking about how Orkney is transforming energy, and what the opportunities and challenges are.